Born March 16, 1935 in Auburn, California, Edwards early schooling was in a Christian Brothers boarding school. He joined the Christian Brothers Catholic community, attended Mont LaSalle Novitiate in Napa Valley and St. Mary’s College, Moraga, California. He left the order in 1955 and attended St. John’s College in Annapolis Maryland, where he met his wife, Valerie. The couple married in 1956. Edwards earned his Bachelor of Arts degree at John Hopkins University and his Masters Degree at Stevens Technical College in Holbrooke, New Jersey. He studied for his doctorate at the University of California in Los Angeles and even took an accredited course in witchcraft while he was there. Edwards was active in the civil rights movement of the 1960s until the assassination of Robert Kennedy. He then decided to take a full-time job with International Business Machines, with whom he had been involved in a work-study program. During his 34 years with IBM, he and his family, were transferred to London, Kobe, White Plains, Rome, Paris and back to California. He was most proud of a software program he wrote, called “Learning to Read by Writing on the Computer”. It was a fun and successful program for kids done when IBM still had an educational department. 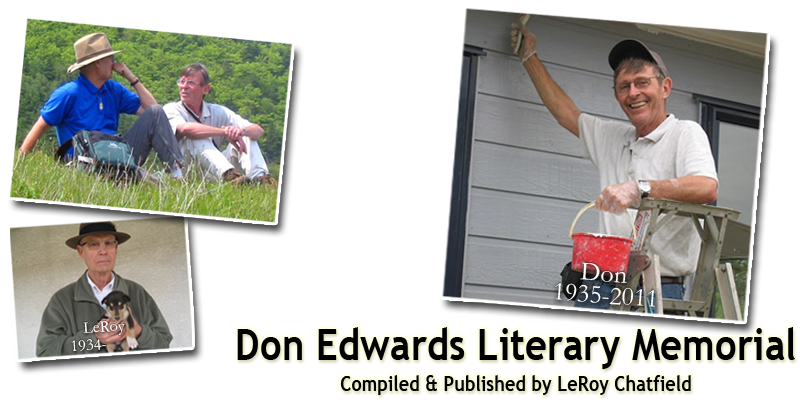 In 2005, Edwards moved to Ajijic, where he wrote a column for the Lake Chapala Review called “Rincon del Don”. He made many friends in the Mexican community and was well known for his cheerful manner. He wrote a book, with his daughter, Leslie Edwards, also of Ajijic, called “And Did You Look Upon The Wall?” It was filled with “sort of true” tales about life around Lake Chapala. He is survived by his wife of 54 years, Valerie Edwards of Ajijic, daughter Tracie Edwards of Boston, Massachusetts, Terrie Edwards-Aoki of New York, Leslie Edwards of Ajijic, and three grandchildren, Max, Aelish and Tyler. Edwards special gift was the knack of making anyone and everyone he encountered feel good. He will be sorely missed in the community. –	Excerpted/edited from the Guadalajara Reporter, September 2011.